Tuffman Equipment & Supply, with retail/rental locations in both Norwalk and Sandusky, Ohio, provides products, equipment and supplies for all your jobsite, lawn, landscape, DIY project and home needs — both rentals and sales. We offer mid-sized to heavy-duty equipment as well as all the essentials to complete your projects including power and manual tools; jobsite safety items and equipment; concrete placing equipment; earth movers; aerial lifts; cutting, grinding and drilling equipment; fasteners; cleaning supplies and more. 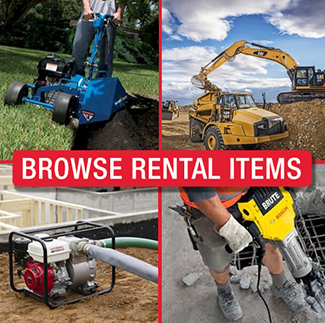 Browse all our rental categories and items and request a quote online for the specific items you need for your next project. Or feel free to stop in to one of our stores or call us at 1-800-622-7052 for more information and we will help you get everything you need for your next project, big or small. TUFFMAN Equipment & Supply has everything you need to get the job done!